Davida Classic and Davida Jet crash helmets. Both individually hand built to exacting standards to ensure the highest levels of quality and performance. The Davida Classic helmet – an authentic example of the 1950’s low dome helmet (think Moss and Jenks at the 1955 Mille Miglia). 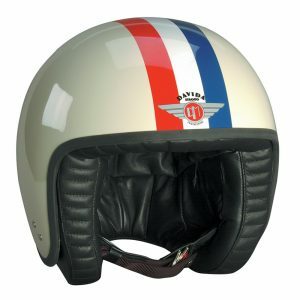 The Davida Jet helmet – a stylish, traditional open face helmet that meets the latest European safety standard ECE R22-05. Davida crash helmets are available in three different, hand painted colourways – Standard, Two Tone and Complex. We can also accomodate specific, one-off colourways – please give us a call to discuss. Due to the hand built nature of these helmets please allow up to three weeks for delivery. 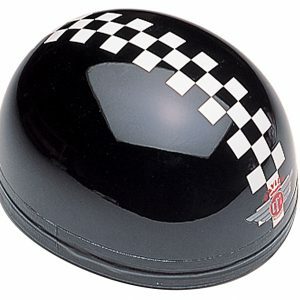 Please note the Davida Classic Helmet does not conform to any current helmet safety standards.